From Sydney, it is a three-hour flight across to New Zealand, where Auckland was in the delightful first buds of spring, fresh and welcoming. Sky Tower dominates the Auckland skyline, and it is possible to make a controlled jump from the southern hemisphere's tallest free-standing structure, or simply watch from the revolving restaurant. New Zealanders seem besotted with throwing themselves off high places, and bungee jumping has the flavour of a national sport. The locals never tire of relating how leaping off a bridge tied to an elastic cord was made popular by a fellow Kiwi. My pleasures in Auckland reached their peak, however, amid the spectacularly beautiful island scenery. 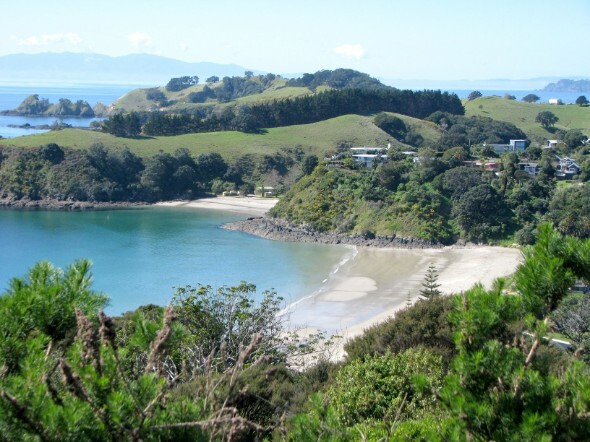 Easily accessible by ferry from the city harbour, Waiheke Island and the volcanic Rangitoto Island were resplendent in the clear blue spring skies. A glass of estate Chardonnay provided a little extra sparkle while overlooking the sand and sea along the glorious stretch of Onetangi beach. The Maori cultural centre and geothermal springs of Rotorua are an easy tour-ride away, and another short excursion out of Auckland gets you to the forests and waterfalls of the Waitakere Ranges Regional Park. On the black sand beach at Piha, I dangled my fingers into the Tasman Sea before heading further east. Even after the impressive size of Australia, the expanse of the Pacific Ocean is stunning. However, the nature of the international dateline meant that it was possible to make a day-long journey from Auckland to Easter Island, via Santiago de Chile, and still arrive only a couple of hours after the departure time. Easter Island must be one of the world’s most unique destinations as well as one of the most remote, being about 2,030 kilometres (1,260 miles) from the nearest other inhabited land. Its history has caused much speculation, and looking into the intense fixed stares of the monolithic statues, the moai, felt like a form of time travel. In addition, good hiking country surrounds the three volcanoes that originally formed this 117 square kilometres (45 sq miles) of island, palms adorn the sunbathing beach at Anakena, and the capital, Hanga Roa, combines a good number of sights and flavours. A visit to the anthropological museum followed by a plate of cheese empanadas provided food for both mind and stomach. 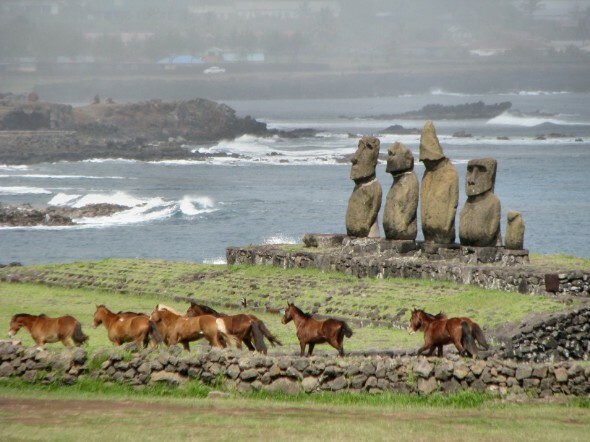 Easter Island is usually reached through Santiago de Chile, which was my natural next stop. As much as Easter Island is unique, Santiago curiously seems to downplay its own identity. There is no central attraction that stands out as emblematic of the city, for example. This is not to say that there are no attractions. The hills of Cerro San Cristóbal and Cerro Santa Lucia provide wonderful, if smoggy, views across the city, and the former is home to a statue of the Virgin that partially echoes the more famous figure of Christ overlooking Rio. The cathedral, the Museum of Pre-Colombian Art, and the bustle of the Plaza de Armas also enrich the city. Santiago is, however, perhaps not the spiciest first taste of South America. Across the Andes, Buenos Aires compensates. This is one of the continent's party capitals, where it is impossible to avoid tango even if you don’t venture into a show or lesson. Strolling around the barrios on a pleasant Sunday morning, when the market in San Telmo was getting into its swing, was as enjoyable as much as struggling through the traffic in the rain on Friday night was not. Some barrios, like La Boca, have become known as dangerous for tourists, but in the centre, a little common sense should see you right. 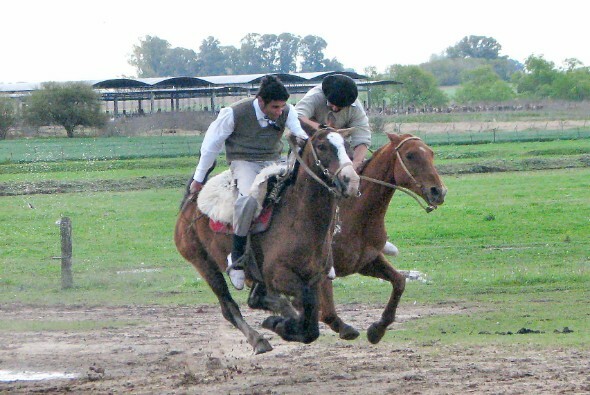 I had too much travel under my belt to dance every night away, but this loss was admirably balanced by a trip out of town to a gaucho ranch, the Estancia Don Silvano, to watch cowboy stunts, eat prime Argentine steak, drink fruity Argentine wine, and enjoy a bit more tango. A half-hour flight across the River Plate, Montevideo is more sedate. Uruguay must be one of the best-kept secrets in South America. Clean and attractive, with miles and miles of sandy beaches and coves, the coastline breathes a seductive charm. Uruguay is pleasantly quirky, too. 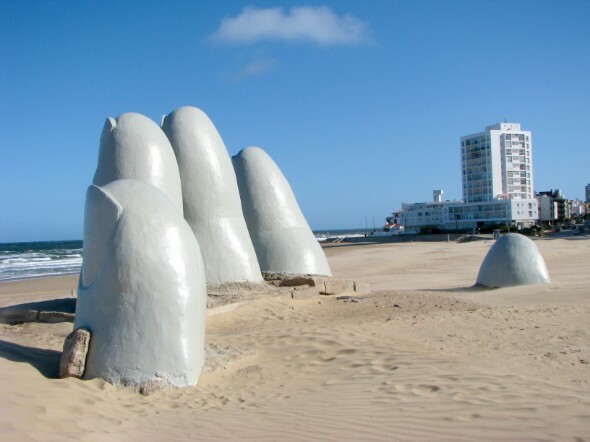 The remarkable fairy-tale design of Casapueblo, the villa and art gallery of the Uruguayan Picasso, Carlos Páez Vilaró, at Punta Ballena, is picturesque to the point of astonishing; and La Mano en la Arena, a giant sculpture of a hand reaching out of the sand at Punta del Este, is endearingly eccentric. There is tango in Uruguay, too, but after the hustle and bustle of Buenos Aires, Montevideo was delightful for its peace and relaxation, and also for its lack of tourists. Its position in the east of South America makes Montevideo a good staging post for the journey back to Europe. A direct flight to Madrid brings a European traveller back to familiar ground. Here, in one of the old colonial centres of power, it is tempting to imagine a feeling of age and stature in the architecture, compared to a youthful eagerness in the former outreaches of empire. The grand buildings resound with bygone years, and the Madrid bull ring emanates the same sort of cultural pull as a coliseum or pantheon. Madrid shares the South American penchant for partying until dawn, but on the last leg of my journey, I was also on my last legs for vigour. After 58 days in eleven countries across four continents, I was ready to stand still for a while. Arriving back at Helsinki-Vantaa airport was a moment of sheer exhilaration. I had actually done it: I had been around the world!